We spend a great deal of time here at PPS talking about a Lighter, Quicker, Cheaper (LQC) approach to public space problems. We believe LQC offers great options for communities when the dominant top-down planning approach makes implementing any changes, no matter how small, nearly impossible. Community-driven experimentation is a key part of the Placemaking process, and we’ve seen LQC solutions have a huge impact in Detroit, Buffalo, and other cities around the world. But what happens when a problem is too big for these low-cost, speedy solutions? Boston’s City Hall Plaza is one of those big problems. Opened to the public in 1968, this public space emerged from an era when the prevailing model was big, brutal, empty expanses surrounding civic buildings (think Albany’s Empire State Plaza, or San Francisco’s United Nations Plaza). 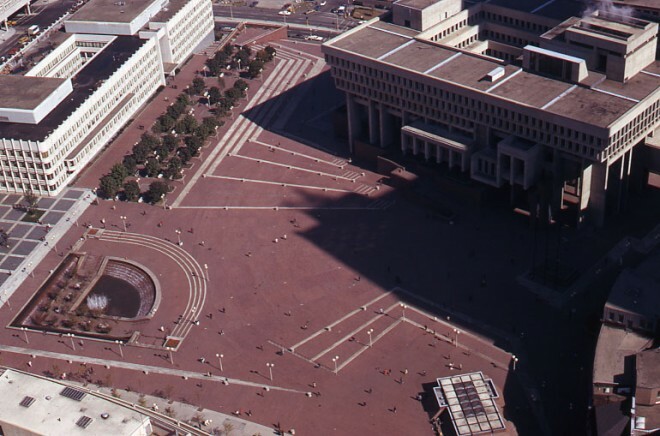 We’ve dedicated some space on this website already to criticizing City Hall Plaza - it’s in our hall of shame, and it’s number one on our list of underperforming public squares. What would that major overhaul look like? PPS can offer some overarching principles, but the answer needs to come out of a comprehensive Placemaking process - one in which the entire city comes together to create a vision for its defining public space. After all, we aren’t the experts, the community is. But we do believe that a good place to start the process is by studying the history of the space. 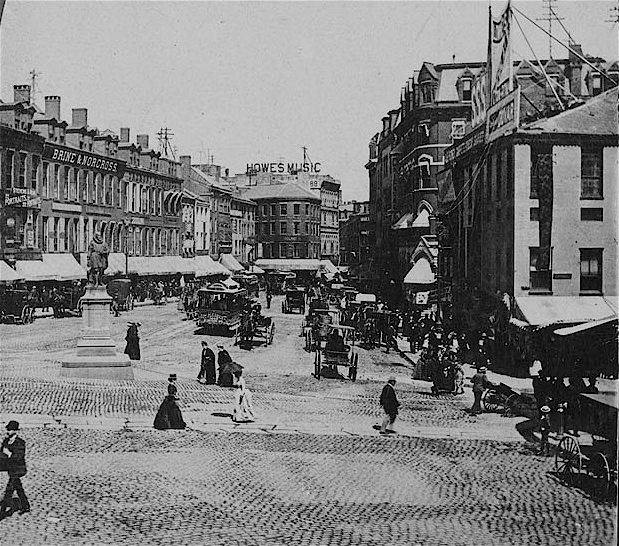 The city of Boston has strong connection with its past, and incorporating this history into the vision for this plaza will help give it the kind of character and identity that is so sorely lacking in the current space. 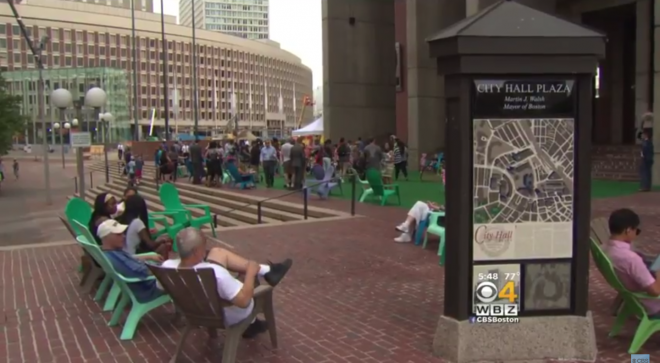 City Hall Plaza is nearly indistinguishable from any number of near-vacant plazas in cities throughout the world. Its replacement needs to be uniquely and proudly Boston. Perhaps we’re picking too much on this small greening effort at City Hall Plaza. After all, anything that brings people into the plaza for any reason is an improvement. But this is a prime example of how placemaking and LQC are often mistaken as an outcome, rather than a process. Putting out some chairs and astroturf isn’t placemaking, it’s window dressing. Worse, it’s an excuse for politicians and city leaders to avoid the long and sometimes difficult placemaking process. This is where the distinction between LQC placemaking and other similar low-cost efforts comes in. The core of LQC projects is that they are created with rather than for a community. Sometimes LQC is enough. Sometimes it’s a great intermediary solution while mobilizing for a larger project. And sometimes, as we hope will be the case for Boston’s City Hall Plaza, it can be a catalyst that drives a larger Placemaking process. But no matter what the solution is, it needs to come from the community.